It shakes up the competition. Their commitment to craftsmanship and a deep connection to the family history transcend the make of the drink. The company offices are held in the same fire station Sebastiani’s grandfather helped build and where he volunteered. Their spirits division named Mixology includes the brands Uncle Val’s Gin, Kirk & Sweeney Rum and Masterson’s Whiskey. They win awards and fans alike. Since all their products are always top quality, we’re pleased they’ve entered into the Bourbon game as well. And they didn’t just enter – they barged in. Bib & Tucker 6 Year Old Small Batch Bourbon is crafted from a mash of 70 % corn, 26 % rye and 4 % malted barley. The grains were distilled twice at a top secret Tennessee Distillery - first using a column still and then a vintage copper pot still. 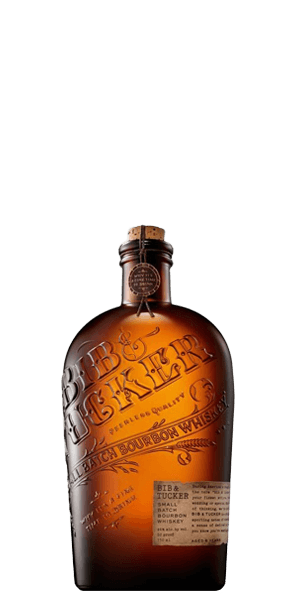 The Bourbon was aged in charred American white oak barrels for six years and bottled at 46 % ABV. It definitely packs a punch, we can tell you that much. The name Bib & Tucker is a reference for a term used in America’s rough and tumble early days to describe a person’s fanciest attire – the one you would wear to a wedding or a special dance. The design of the bottle acknowledges the era as it takes the shape of an enlarged flask with ornate hand-lettering. But the appearance is just the beginning. This Whiskey will grab your attention with looks and contents. The flavor profile is as unique and complex as you’re gonna find. If you’re a Bourbon fan, you’ll surely appreciate all the dedication and craftsmanship that goes into making this product. If you’re not a fan - well, let’s just say this Bourbon could force you into a change of heart. What does Bib & Tucker 6 Year Old Small Batch Bourbon taste like? The Flavor Spiral™ shows the most common flavors that you'll taste in Bib & Tucker 6 Year Old Small Batch Bourbon and gives you a chance to have a taste of it before actually tasting it. One of my new favorites. So many flavors and just the right amount of burn! Wow, I cant believe I waited so long. I should have tried this earlier. It’s a great stand alone whiskey. Don’t be fooled by the California info. It’s a classic bourbon/whiskey! This is probably my favorite bourbon right now. I think it leans more towards a butterscotch flavor than the caramel we are accustomed to with bourbons, and it has a smooth finish. I think it is the best dollar for dollar value on the market. My Favorite Bourbon! Hints of fruit, vanilla, caramel and spice. Very Smooth! It is an outstanding, rich, Tennessee sour mash bourbon that has a sweet birth with notes of fruit, oak, chocolate, vanilla, caramel & spice; while a bakers life adds notes of yeast, cookie dough, dried apricot, ginger, cinnamon, charred oak & malted barley; that leads to a long & complex death with hints of corn & chestnuts. First thing to come to mind is yummy!